Lepicol also contains Fructo-oligosaccharides which have been shown to complement high fibre foods for healthy bowels by supporting intestinal healthy bacteria (probiotics). Psyllium husks (plantago ovatalispaghula, Inulin, Live Bacteria (Lactobacillus rhamnosus, Bifidobacterium bifidum, Lactobacillus acidophilus, Lactobacillus plantarum, Lactobacillus bulgaricus). 0.5-1 (2.5-5g) heaped teaspoon mixed with a glass of water or juice once or twice daily and consume immediately. Parents should seek the guidance of a medical practitioner before giving Lepicol to children under 11 years. Taking Lepicol without water can cause choking. Always aim to consume 200-250ml of liquid with every 5g (heaped teaspoon). Please consult your doctor before taking Lepicol if you have recently had intestinal surgery or you have an intestinal obstruction. If at any time you experience discomfort after taking Lepicol, stop taking and seek medical advice. 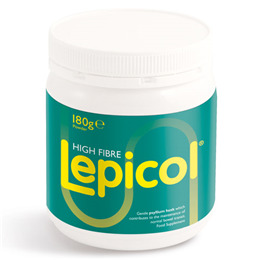 Below are reviews of Lepicol Healthy Bowels Formula - 180g Powder by bodykind customers. If you have tried this product we'd love to hear what you think so please leave a review.